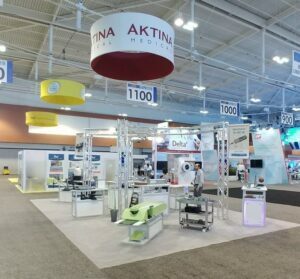 Congers, NY (November 6, 2018) – Aktina Medical, the industry’s primary source for radiation oncology needs, leveraged its participation at the ASTRO show’s 60th Annual Meeting by showcasing the company’s latest advancements for improved radiosurgery accuracy, and patient immobilization and comfort. Featured Aktina solutions on display at ASTRO 2018 included its SenoView prone breast system, SpiroCheck Duo® quality assurance system; Electronically Interlocking Small Field Circular Cones, and the Memorial Cradle 2 immobilization system for body radiosurgery. 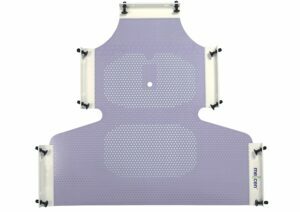 The Aktina SenoView prone breast system solves many of the current problems with standard prone breast boards. The unique patented design orients the patient in a semi-decubitus position resting on an adjustable sternal bridge, allowing the treatment field edges to be viewed and marked for both the medial and lateral fields. SenoView delivers a significant advantage over standard prone breast boards, where the medical field cannot be visualized on the patient’s skin for field edge marking and verification. SpiroCheck Duo® quality assurance system for Active Breathing Coordinator (ABC) is accurate to within 1.25%, ensuring precise readings and performance in critical radiotherapy planning and treatment. 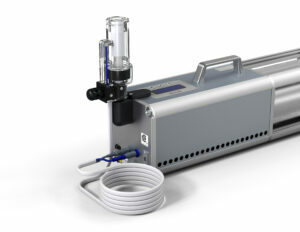 A Restriction of Hazardous Substances Directive (RoHS) compliant device, SpiroCheck Duo completes a full calibration of the ABC’s spirometry and balloon valve in less than two minutes to help minimize downtime. Aktina’s Electronically Interlocking Small Field Circular Cones ensure accurate radiation dosage by eliminating human error. The patented system of lead-based interlocking cones with stainless steel sleeves to prevent lead contact feature carved channels and grooves that match corresponding channels and grooves carved into the applicator. As each cone is inserted into the applicator, they depress (or don’t depress) specific switches and confirm that they are the proper size cone for the programmed dosage. The control software, which has been integrated with the cones and applicator, compares the installed cone with the programmed plan and confirms they match before proceeding. The system also comes with a quality assurance cone that depresses every switch and tests them to assure functionality, ensuring that any installed cones will be recognized and confirmed accurately. Also displayed at ASTRO 2018 was Aktina’s Memorial Cradle 2 immobilization system for body radiosurgery, which provides a unique method for patient immobilization. Originally co-developed between Aktina Medical and Memorial Sloan Kettering Cancer Center, the system utilizes side pressure on the patient to achieve superior immobilization and patient comfort. This unique modular approach allows for excellent flexibility in SBRT positioning with direct index to table crossbar and paddle sets. A study published in the International Journal of Radiation Oncology confirms cone-based linear accelerator SRS program using FFF beams was established with high precision and accuracy in targeting and dosimetry. Radiology physicians and technicians face the constant challenge of balancing treatment effectiveness with patient comfort. Of course, many medical procedures from simple injections to surgery involve some inherent patient discomfort, but radiotherapy has unique characteristics that set it apart from other treatment regimens. For example, patients are normally completely conscious during radiology treatments yet must remain perfectly still. In another example, modern treatments such as SBRT and IMRT depend on high-accuracy positioning of the treatment area to prevent damaging surrounding healthy tissues. The combination of these two characteristics creates the challenge of immobilizing patient movement in a precise position, while they are fully conscious, for the duration of the setup and treatment – a time period that can typically last from 15 to 30 minutes, or even longer. In the past, invasive frames attached to the patient’s skull were used to provide localization and immobilization for cranial radiotherapy, an inconvenient, costly, and typically painful process. Radiation treatment providers knew there had to be a better way. The ideal answer to this challenge would be to immobilize the treatment area while also providing for the maximum possible patient comfort. This is because physical discomfort such as pressure points will cause the patient to fidget, or try to move, to gain relief even when they know that they are supposed to remain still. Patients may not even be aware of these attempts at movement – such human movements are often triggered by unconscious drivers. Treatment of tumors in the head and neck area are particularly sensitive to positioning because of the close proximity of other essential organs and tissues. Healthy tissues in the brain, eyes, spine, and salivary glands are only a few of the areas that need to be protected during treatments, and achieving isolation of these areas depends on both precise positioning and prevention of movement. Fortunately, Aktina offers two distinct families of head immobilization products that can be used for treatments in the head and neck area that offer both high accuracy positioning and patient comfort. The first is based on shape-conforming thermoplastics, and the second is based on patented vacuum fixation. Both types provide positioning without requiring any action by the patient – the patient can relax as best possible given the situation. Thermoplastics provide cost-effective, easy-to-use head immobilization systems with good accuracy. They are flexible enough to use with nearly every patient, both face-up and face-down. And, they can be used for head-only immobilization, primarily for cranial treatments or for head-and-shoulder immobilization, also ideal for neck treatments. The only difference between these applications is the size of the thermoplastic mesh and the associated frame and clamping system. Aktina offers a full range of both head masks and head and shoulder masks to support specific needs, including models with frames to fit many popular clamping systems and models with partially open faces to further increase patient comfort if the treatment regimen allows. The second family of head immobilization products is based on a patented fixation method called PinPoint from Aktina that uses vacuum technology to match a fitted plate to the patient’s upper palate. This method maintains an open, unrestricted view for the patient, which can be better for patients that have anxiety about being confined by a mask. And, the PinPoint system enables sub-millimeter accuracy – the most accurate patient location and fixation without the need for invasive frames. The PinPoint approach can also be used for extracranial treatments and with higher accuracy than thermoplastic masks. To provide support from below the skull, several options are available, including thermoplastic support hammocks, standard cushions, and customizable foam cushions. Because these are not used for localization or immobilization, they can be selected based on preference and comfort. Aktina is proud to provide the latest, most advanced offerings for radiotherapy cranial and extracranial localization and immobilization. Today’s solutions provide greater positioning accuracy than ever before, while also increasing patient comfort. Increased comfort translates into increased patient confidence and cooperation, minimizing any added trauma associated with treatment and creating a win-win situation for treatment providers, patients, and better outcomes. The discussion of radiosurgery is unsettling for most people outside of the medical field, as the circumstances surrounding this procedure are typically not good. Imagine the additional stress associated with any discussion of immobilization, and the serious consequences that can result if unintentional movement occurs during radiosurgery treatment. Fortunately, there have been advancements in abdominal, body and cranial radiosurgery immobilization techniques that are non-invasive, help ensure treatment accuracy, and provide a higher degree of patient comfort. Abdominal radiotherapy immobilization greatly relies on the Elekta Active Breathing Coordinator™ (or “ABC”) for a repeatable patient breath hold with a consistent volume every time. This solution allows operators to collect images during a breath hold, and irradiate during an identical breath hold, removing the effects of motion for more accurate treatment. A key to the successful use of the ABC system is increased patient comfort and confidence, which is achieved via proper mouthpiece fit. Aktina Medical recently updated the design of its ABC mouthpieces to provide even greater patient comfort and flexibility. The materials and design of the mouthpiece provide a comfortable seal that minimizes patient effort and stress, making the process easier for both the patient and the technician. This combination of comfort and flexibility built into Aktina ABC mouthpieces conveys high quality and instills confidence in patients, minimizing any added trauma associated with radiotherapy. And because the comfortable mouthpiece also forms a reliable seal, the accuracy of the breathing volume measurement is improved. Accurate volume measurement also improves correlation between the imaging and treatment positions, which in turn improves overall treatment accuracy. Stereotactic Body Radiation Therapy (SBRT) immobilization solutions improve treatment accuracy and patient comfort, while also reducing overall costs. Traditionally SBRT required technicians to employ restrictive components to immobilize patients. Aside from causing patient discomfort and added anxiety, these immobilization components are typically quite bulky making them difficult to manipulate, take longer to set-up, and require substantial storage space. Aktina Medical took a unique approach to SBRT immobilization with the introduction of its Memorial Cradle 2 Lateral Support System. Developed in conjunction with Memorial Sloan Kettering Cancer Center, the Memorial Cradle 2 features a unique modular design that increases clinicians’ flexibility and streamlines workflow processes, while causing less stress to patients undergoing treatment. The system’s lateral support paddles mount directly to the treatment couch eliminating the need to mount and adjust additional accessories or hardware. This unique method for patient immobilization provides excellent flexibility in SBRT positioning with a direct index to table crossbar and paddle sets. The Memorial Cradle 2 Lateral Support System provides numerous benefits including: active patient support by applying lateral side pressure to increase treatment setup accuracy and reproducibility; modularity of design that improves cost-effectiveness with fewer components that require less storage space; the elimination of bulky overlays to minimize attenuation and increase treatment options and flexibility; and universal compatibility with virtually any treatment or CT couch top. Cranial radiosurgery immobilization has been greatly enhanced with the application of new vacuum fixation technology employed in solutions such as Aktina PinPoint. A unique frameless localization and fixation system, Aktina PinPoint’s non-invasive approach provides patient-friendly immobilization with sub-millimeter positioning accuracy. PinPoint’s non-invasive approach reduces stress on the patient and makes procedures easier for the entire radiation oncology department. With PinPoint, the patient does not have to be simulated, planned and treated on the same day, allowing more flexibility for single-fraction and multi-fraction SRS. With two large treatment and imaging areas, PinPoint is fully IGRT compatible, providing the required flexibility for today’s demanding treatment modalities. At Aktina Medical, we continually seek input from technicians in the field to see how we can further improve our current immobilization solutions, and develop new and more efficient solutions to improve overall patient treatment, comfort, and recovery.